Before photo showing the corner position of the old kitchen and unused adjacent space. To watch the video and hear kitchen designer Jessica Omoto discuss the kitchen remodel, click on the photo below. Along with updating the kitchen, the couple decided to take advantage of their home’s waterfront setting with the kitchen remodel. Tearing out a wall not only enlarged the space, but gave the kitchen a whole new view. “They have these doors that look right out onto the water, so it helped to bring a little more light into the space as well,” says Omoto. Before photo of the space and windows looking out to the waterfront. 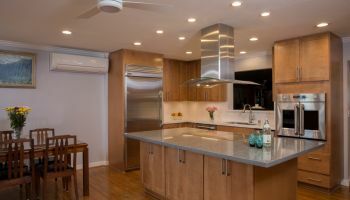 The kitchen remodel enlarged the view of the waterfront and incorporated a buffet area. After enlarging the space, it was time to focus on style, starting with the center island. With the popularity of kitchen islands today, some tend to be a bit uninspired but, according to Omoto, islands are where designers can really get creative in a kitchen remodel. “Islands are actually fun because you can do anything with an island, any shape you can create,” comments Omoto. Instead of the usual rectangle, Omoto went for something unique. Describing the design, she says, “One end is deeper and then it curves down to the other narrower end. It’s just a little bit different from anybody else’s island.” Beyond its form, the island is functional, too, with storage on one side and seating on the other. It also houses the oven and cooktop. Before photo of the old kitchen island and position of kitchen. New kitchen island with a unique and functional shape being the focal point of the enlarged kitchen. Throughout, the kitchen remodel incorporated Diamond-brand Shaker-style cabinets all in cherry wood, with the island displaying a deeper, contrasting tone. “On the island, we did a chocolate finish, just to give it that darker, richer color,” says Omoto. The white and gray marbled pattern of the granite countertop blends nicely with both cabinet finishes. Another way Omoto combined form and function in the kitchen remodel was by designing a buffet area with glass doors and under-cabinet refrigeration. It’s a perfect place to display collectibles as well as a fun spot for entertaining. The under-cabinet beverage center is by U-Line, while all other appliances are by Thermador. Old cabinets, stove top, refrigerator and other appliances. New kitchen with Shaker-style cabinets from Diamond, Thermador appliances and U-Line beverage center. Lighting also played multiple roles in the kitchen remodel, with overhead recessed lights, stylish pendant lights and dramatic under-cabinet lighting. For a cleaner look, the outlets were located underneath the cabinets as well. “It gives the clean appearance on the tile backsplash,” says Omoto. The kitchen remodel incorporated numerous lighting options, including recessed lights, under-cabinet lighting and pendant lights. 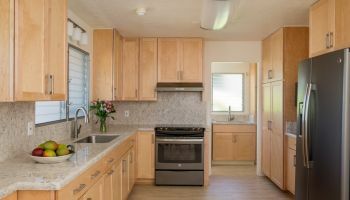 To see more projects by Homeowners Design Center, or to find out how they can help you with your kitchen remodel project, just click on any of the photos above or wherever you see the company name.